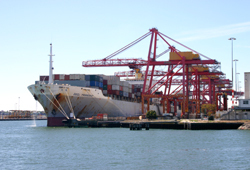 The City to Williamstown Ferry takes you all the way to Williamstown, an old maritime seaport. It is an inexpensive way to do a Melbourne River Cruise. You will travel from Southgate downstream the Yarra, get great city views, past the Docklands, under the Bolte Bridge and along Melbournes container port with its gigantic cranes. A one-way trip is just under one hour. It is one of our favourites and we tend to take visitors on this ferry trip. We usually take a mid morning ferry, stroll and lunch at Williamstown, and return in the afternoon  a pleasant laid back day. The ferry itself is comfortable and gives you good views, a sundeck as well as protection from the weather. Williamstown is a historic coastal village. It is located in a sheltered harbour on the west side of Port Phillip Bay. The ferry docks at Nelson Place, which has the best views of the Melbourne city skyline. It invites with a strip of restaurants, sidewalk cafes, quaint shops and galleries. There is also a craft market every third Sunday. 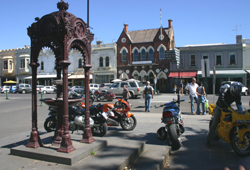 Williamstown is considered to have the greatest hotels and churches, many of which are heritage listed. It is located just north of a large area of bird sanctuaries and you are likely to get to see magnificent black swans and a vast array of other bird life. An interesting site to check out is the Williamstown lighthouse, a bluestone tower at Point Gellibrand at the southern tip of the Williamstown peninsula. From 1858 to 1926 this used be a Timeball Tower - a signalling device to ships, where the large ball on the top was dropped each afternoon at one o'clock to allow shipmasters moored offshore to correct their chronometers. Port Gellibrand is the place where the first settlers from Tasmania settled in 1835 with their cattle and sheep. It used to be a primitive settlement until the Victorian gold rush of the 1850s, when Williamstown became one of the first business centres and a major cargo port. 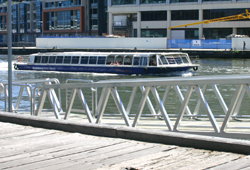 There are a number of Williamstown ferry operators and Melbourne River Cruises. One of them stops at Scienceworks museum, which is a pleasant way of getting there. They also have a vessel with a larger sightseeing deck that departs from the Exhibition Centre on weekends.